Hardened, built up stains which appear on the armpits of clothing, restoring your clothes to their original appearance. 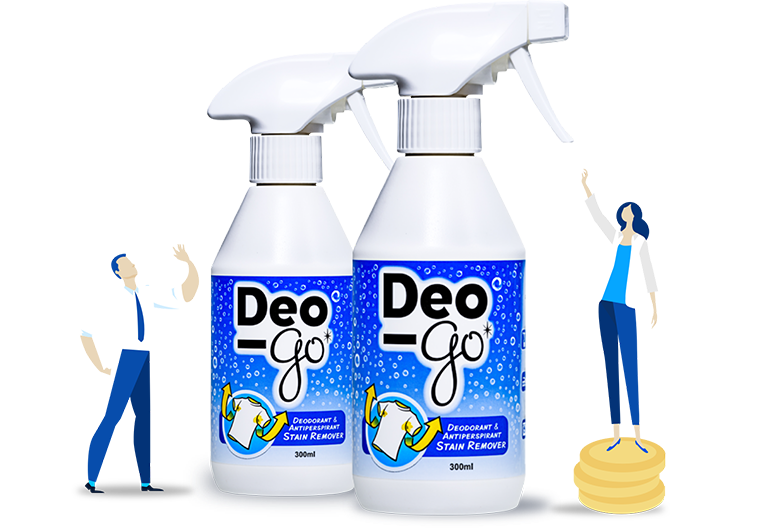 Deo-Go is sold in a 300ml spray bottle, which will treat between 18-25 shirts. There is no other product available which can make these claims, or tackle this type of stain, making Deo-Go totally unique! These armpit stains are often mistaken for wear and tear or permanent build ups of grime, and independent surveys have shown that many people throw clothing away, without really understanding the problem. The problem isn’t you; it’s the deodorant and antiperspirants that you use daily! The residue from these builds up on clothing over time, and gives the appearance of discoloured areas and stiff patches. Deo-Go will remove these stains and hardened patches, restoring your clothing to its original appearance. 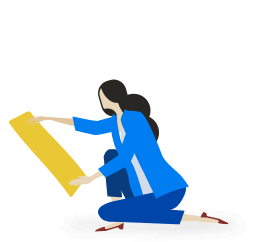 We can save you time and money, and are so confident in our product, that we offer a 100% money back guarantee. Deo-Go has been tested extensively on different garments and fabrics, many with extreme staining, and has always been successful in restoring them to their original condition. Never throw another stained shirt away…use Deo-Go and prepare to be amazed by the results! Check out our Before & After pictures and find out what our customers are saying about Deo-Go ! Deo-Go’s active ingredients target the antiperspirant or deodorant residue build-up, dissolving and completely removing the stains and stiff patches, restoring the garment’s original appearance! Deo-Go is sprayed on to the stained area of the armpit and left to dissolve the residue for between 10 to 30 minutes, depending on the severity of the stain. A little scrub during this time with a short bristled brush will speed up the process. Then simply wash, as per the garment’s normal washing instructions. Always remember to spot test an inconspicuous area of the garment prior to treatment. Spray, scrub and wash. That’s it! Simply put, armpit stains in clothing. This is a big issue that people don’t talk about. 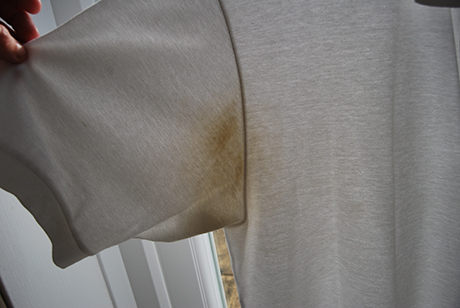 Have you ever looked at a shirt or tee-shirt and seen either white or yellow stains on the pits? Have your shirts ever felt stiff and uncomfortable to wear around the armpit areas? This is due to the deodorants and antiperspirants that you use every day. The residues from these, combined with sweat are transferred on to whatever you are wearing. Over time, these residues build up and cause your clothing to look discoloured and permanently stained. These stains won’t come out in a normal wash cycle, and boiling and bleaching actually makes these stains worse. This is where Deo-Go comes in. Although your clothing may appear to be bleached, faded or stained beyond the point of revival, this is not the case … Deo-Go can save it! Deo-Go has been created by MD Technical Solutions Ltd.
Deo-Go can be used on any color garment, but it’s always best to test a small area for color-fastness. 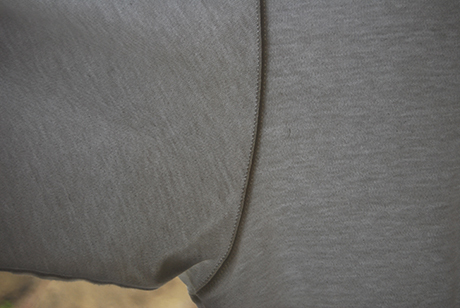 Turn garment inside out. Spray a liberal amount directly onto the stains, ensuring both sides of the fabric are wet. Scrub the stain with a short bristle brush, and leave for 30 minutes. For those tougher stains, give it another scrub! Wash the garment (separately from other items) according to its normal washing instructions. Check first: It is important that you always test for colour-fastness before use on your garments. Spot test an inconspicuous area and thoroughly inspect for any signs of discolouration. Always perform a compatibility test on an inconspicuous area of the garment by applying a small penny sized spot of Deo-Go. Wait a minute, then rinse the area and inspect for any signs of discoloration. Spray ’n scrub: Turn your garment inside out. Spray directly onto the stains, ensuring both sides of the fabric are fully saturated. 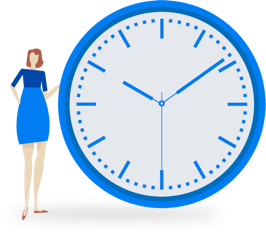 Scrub with a short bristle brush, and leave for a minimum of 30 minutes. For those tougher stains, give them another scrub during the soak time and apply a little more Deo-Go if required. As a guide, use around 10 sprays on each armpit area, to ensure good coverage and saturation. When scrubbing, pay particular attention to the inside seams and any areas of heavy staining. If the fabric begins to dry before the end of the soak period, spray a little more Deo-Go on to the stain to keep it active. 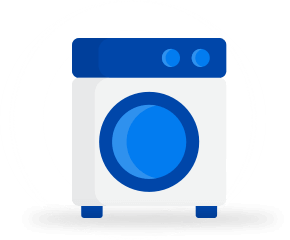 Machine it: Wash the garment (separately from other untreated items) as per the normal washing instructions.If any stain remains, repeat the treatment. Do not wash your treated item with any clothing that has not been previously spot tested for colour fastness. Inspect the previously stained area (it may help to hold your clothing up in front of a bright light or window) and prepare to be amazed! If any stain remains, repeat the treatment while the clothing is still wet if possible. Deo-Go can react with certain fabric dyes, permanently discolouring them. Always test on an inconspicuous area of the garment first. Do not use on suede or leather. Do not leave on unprotected surfaces (especially stainless steel) for prolonged periods, and always clean surfaces after use. Do not use on lacquered or varnished surfaces, or porous materials, e.g. marble or stone. If you are in doubt about your work surface, we recommend a plastic washing bowl, or a tray. Always clean the surface after use. Keep in the original container. Storage: Deo-Go should be stored and used at room temperature. We tested all of the stain removers available on the market today and nothing was even close to effective. We looked online and tried all of the home made remedies suggested, from toothpaste to vodka, and although hopeful, were disappointed with the results. Through our searching online, it became very apparent to us that there are many people looking for a solution to deodorant and antiperspirant stains. There are literally hundreds on Q&A sites, and blogs, asking the same question over and over “how do I get these stains out?”. It became very clear to us that there just wasn’t an effective solution to deodorant and antiperspirant stains. We worked on, and formulated the solution Deo-Go, solely for our own purpose initially, but found that we had created a product that was 100% effective and so fantastic, that we decided to market our invention so that other people could benefit from our discovery. To date, we have sold Deo-Go to customers all over the world. Last year we commissioned an independent survey to find out just how many people needed a product like ours to remove underarm stains. The results that came back astounded us. Out of 334 people interviewed across the UK, 36% had thrown clothing away due to deodorant and anti-perspirant staining, and over 50% would definitely buy our product. Deodorant and Antiperspirant stains are a huge problem but no one talks about it! What makes our product so perfect, is that in today’s climate of “make do and mend”, rather than buying new, we help this cause! There are many people who can’t find a solution to deodorant and antiperspirant stains, and our goal is to let everyone know that now there is! To help you save your perfectly good clothes!. These stains won’t come out in a normal wash cycle, and boiling, heat exposure and bleaching actually makes them worse! This is where Deo-Go comes in. Although your clothing may appear to be bleached, faded or stained beyond the point of revival, this is not the case….Deo-Go will save it! Proprietary stain removing, cleaning and laundry pre-treatment products such as Vanish, Shout, Tide, Stain Devils and Glow-white etc. Bleach – Many people recommend the use of bleach, hydrogen peroxide or ammonia for deodorant stain removal. However, bleach reacts with the deposits and turns the stain even darker. Baking soda (sodium bicarbonate) or a mix of baking soda, water and peroxide – These are regarded by many as one of the most effective ways for removing deodorant, antiperspirant and sweat stains. A paste of aspirin, cream of tartar and water. Leaving a stain to dry in direct sunlight. Extensive testing has shown us that none of the above suggestions are even close to effective. Deo-Go is the only product or method of cleaning a shirt that is 100% effective at removing deodorant and antiperspirant stains. Don’t despair if you do get these stains, use Deo-Go and your shirt will be as good as new!